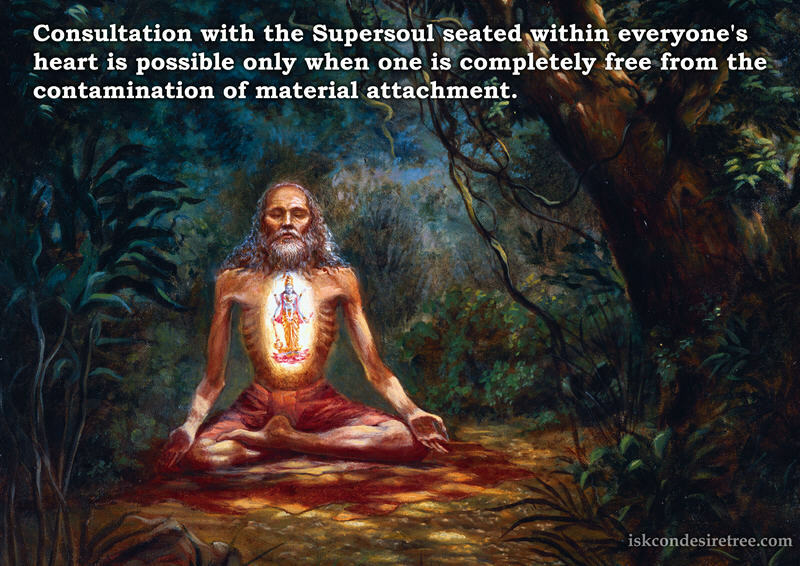 Consultation with the Supersoul seated within everyone's heart is possible only when one is completely free from the contamination of material attachment. One should go for parikrama, because in parikrama, everything is there. Shravanam, kirtanam, smaranam, so that we can easily develop attachment for Krishna. An intelligent person should reject all bad association and instead take up the association of saintly devotees, whose words cut off the excessive attachment of one's mind. By taking darshana of the archavigraha, the deities, our attachment to our body fades away. If we are attached, potentially there will be fear of losing whatever we have. One must read Srimad Bhagavatam regularly and with scrutiny to gradually become attached to the chanting of the Hare Krishna maha mantra.